About Us | PAMPEANA EMPANADAS - Seattle and Tacoma's Home of the Baked Empanada! Pampeana describes anything "from the Pampas", the region in Argentina where empanadas originated. At Pampeana we provide traditional-style baked empanadas with delicious and creative fillings. In line with this tradition, we make each empanada by hand and in turn each batch will have a somewhat unique look and flavor! Alexis met Leandro Torres in the Argentine ski town of San Martín de Los Andes in 2005. Fairly soon thereafter, Leandro, a schooled Argentine chef, showed up in Seattle and wow-ed everyone with his batches of homemade empanadas. We loved that his baked empanadas were a much healthier alternative to the usual deep or pan-fried empanadas to be found in the local restaurants and stores. It was decided that not only did we need to have constant access to these, but so did the rest of the Seattle area! 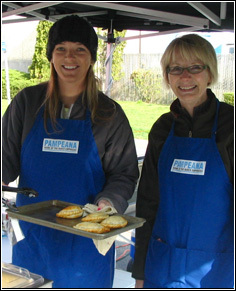 Now we are Pampeana Empanadas, providing the baked hand-held treats for local events, parties, family dinners and more. We are constantly looking for local events and groups to work with, so if you have any ideas or interest, please contact us!